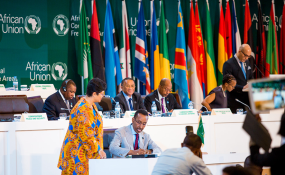 Forty-four countries signed the African Continental Free Trade Area, 43 inked the Kigali Declaration, while 27 countries adopted the protocol on free movement of persons. Ethiopia and 43 other African countries have signed the African Continental Free Trade Area (AfCFTA) agreement in Kigali, Rwanda, today. The agreement, which was signed during the 10th Extraordinary Session of the Assembly on AfCFTA, will set up a massive free trade area to improve regional integration and boost economic growth across the continent. Ministry of Foreign Affairs has confirmed that Ethiopia is among the 44 countries that signed the agreement. The agreement commits countries to removing tariffs on 90 percent of goods, with 10 percent of "sensitive items" to be phased in later. It will also liberalize trade in services and might in the future include free movement of people and a single currency, it was learned. AfCFTA will have to be ratified by individual countries to boost intra-Africa trade, which stands at around 10 percent of all trade across the continent, by creating free trade zone. The agreement brings together 1.2 billion people with a combined gross domestic product (GDP) of over 2 trillion USD.